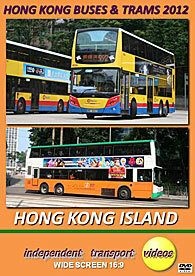 Yet again the independent transport videos cameras returned to Hong Kong Island in 2012 to record the action of the buses and trams in this vibrant Asian city. A lot has changed since our last programme filmed in 2010. There are new bodies on the famous double deck tramcars, many new deliveries for the main bus operators, New World First Bus, Citybus and K.M.B., and farewell appearances of many well known types which are soon to be retired after a busy life serving the Island and New Territories. We have a look at the trams in greater detail in another title we filmed during this visit ‘Hong Kong – Tram Rides’ which is now available. The filming on this programme starts in Sheung Wan, in the north west of the island. We then make our way along the northern coast to Siu Sai Wan in the north east before heading south to Aberdeen and concluding in Stanley, with a lot of action in between! So, from the trams and buses in Sheung Wan we make our way to Central Bus Station, by the Star Ferry to film the action. Just along from here is a major construction site where a road link will run from here to Wan Chai, which means that Man Yiu Street has been moved and this provides us with an excellent vantage point to film the buses running from the bus station. We then reach the next bus station in Central, located at Exchange Square. This bus station, that in the past was used by C.M.B., is now used mainly for Citybus services. Look out for Citybus’ unique two axle Wright bodied Volvo 7500. Which is one of only two produced for the Hong Kong market so far. From here we continue filming on the busy Connaught and Des Voeux Roads in Central where the buses mingle with the trams – most of them sporting very colourful advertising liveries. The newly rebodied trams can be identified by their electronic destination displays and smooth body lines. Wan Chai is our next location and then on to Causeway Bay and Tin Hau. From North Point we move along to Shau Kei Wan and on to Siu Sai Wan. Now it is time to move to the south of the island. We head to Aberdeen bus station where our filming starts. We then move into the streets for more action, where you will see some of the older NWFB Dennis Condors in service and brand new Citybus Youngman single deckers which have just entered service. We then board Citybus Enviro 400, 7004 (PZ 5504), on service 973 to Stanley. Stanley Market is very popular with tourists so there are plenty of buses serving this small town on the south coast of the island. Here we see many Citybus Enviro 400s as well as some older short Dennis Dragons which will soon be retired from service. A picturesque location to end our filming on Hong Kong Island.